Pediomelum esculentum (Pursh ) Rydb. Also Called: Indian breadroot, prairie turnip, prairie potato. Stems: Erect, 1-3, simple or rarely branched, densely hairy. Leaves: Alternate, on hairy stalks 1 to 6 inches long, palmately 5-foliolate; leaflets elliptic to oblong lanceolate, 1 to 2 inches long, 1/2 to 3/4 inch wide, mostly glabrous above, appressed-hairy below; tips rounded, blunt or pointed. Inflorescences: Racemes, spike-like, dense, about 2 inches long, 1 inch thick, on stout stalks in leaf axils. Flowers: Calyces bell-shaped, 5-lobed, hairy; corollas papilionaceous, to 3/4 inch long, blue, fading yellowish; stamens 10, 9 united, 1 free. Fruits: Pods, egg-shaped, beaked; seeds 1, oblong, smooth, brownish. Habitat: Prairie hillsides, plains, bluffs, stream valleys, and open woodlands. Distribution: Throughout except southwest corner of Kansas. 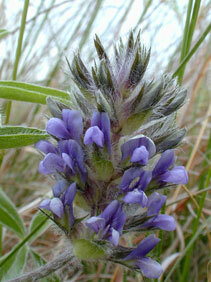 Uses: Breadroot scurf-pea probably was the most important wild food gathered by Native Americans of the Great Plains. The tuberous root can be eaten raw, cooked, or dried. By mid-summer, the leaves and stem break off and blow away. Plains tribes dug the tubers before the tops were gone and often dried them for winter use. Comments: Breadroot scurf-pea will decrease with grazing and is uncommon outside of undisturbed prairie.